"SOLUTIONS TO YOUR GARAGE DOOR OPENERS UPS AND DOWNS"
Universal Remote Control and Keyless Entry! Driveway Alert no more missed visitors or deliveries! Indoor or outdoor use. All orders are shipped same or next day!!! Genie Screw Drive Garage Door Opener. Genie Pro98, Pro88, Pro90, Pro98-8, Pro88-8, Genie BlueMax CM8500, CM8500-8, CM7500, CM7500-8, PRO83, Pro93, SD2000, SD3000, SD5000, SD8000, SD9000, SD9500, Pro82, Pro820, PRO8200, CM7200, GS800, Pro980, Pro9800, Pro880, Pro8800, GS850, GL9000, GXL9500, GXL10000, CM7600-IC, CM8600-IC, Pro95, Pro429, CM8500-S, CM7500-3, G8000, G2500, Pro98-S, PRO88-S, GS429, SD5050, G5000, GX9000, G2000, 8600, 404, 450, 409, 459, 419A, IS SERIES, IC SERIES, ISL SERIES, CSD0706, CSD0800, H4000A-2, H6000A-2K, H4000A-2, H6000A-2K, IS550-2X, DirectLift, 3060L, 2060L all models may not be listed. If you are still unsure of part or item you are looking for please Contact Us. Direct replacement for most models of Genie Screw Drive Garage Door Openers. Rope length cut for 7 foot high doors. Provides smooth and quiet operation on screw drive openers. This lubricant, with yearly application, prolongs the life of the worm and drive gears in chain drive door openers. Prevents carriage/trolley from head crash. For Genie Screw Drive and Excelerator models and Overhead Door Overdrive and Signature Series models. Direct replacement for all models of Genie Screw Drive Garage Door Openers. May be used for up or down limit. Screw Drive limit switch lead. Grey - used to connect up limit to sequensor. Brown - used to connect down limit to sequensor. Wire clip for Genie Screw Drive and Overhead Door Signature Series openers. Secures safety sensor wires and limit wires to top of rail. Coupler. Attaches rail assembly to door opener motor head. For clutchless screw drive openers. Includes 2 collars and 2 clips. For all late model Genie screw drive door openers. A MUST for all Genie Screw Drive and Trac Drive garage door openers. Keeps opener running efficiently and quiets chatter. Same as part number 31056A stamped on printed circuit card. Part number found on transformer. Part number found on capacitor. Controls most functions of door opener. Must match part number. The part number is found on the small white label in the sequensor/secoder (board). Internal receiver, 12 switch coding 390 frequency. Controls remote operation of door opener. Must match part number, part number is found the small white paper label on receiver board. Compatible with part number 20285R. Internal receiver board for Genie Intellicode Garage Door Openers. 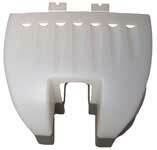 Compatible with part numbers 34375R, 31171R, 33629R, 35593LA, 20437R, 36306R. 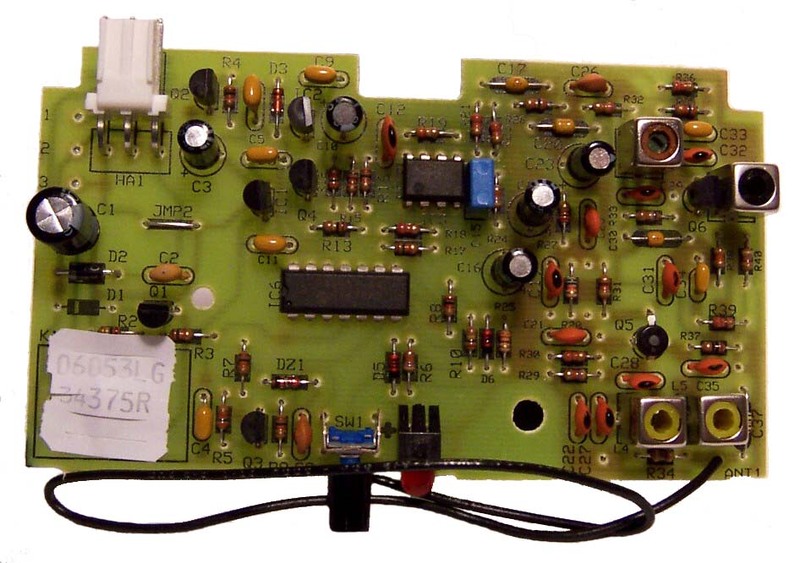 This is the factory replacement internal receiver board for the OBSOLETE 20437R receiver. It is smaller in size, but installs, mounts, and programs in the same fashion as the old board. Compatible Garage Door Opener Keyless Entry is the GK-BX. The part pictured on the left replaces the previous style (part number 22668A) pictured on the right. The part pictured on the left is the one that will be shipped. The Header Bracket pictured on the right has been discontinued and is NO LONGER AVAILABLE. For Genie Screw Drive Garage Door Openers. Attaches front end of rail assembly to header bracket (22668A) shown above. This part is located where the rail of the garage door opener meets the power head. 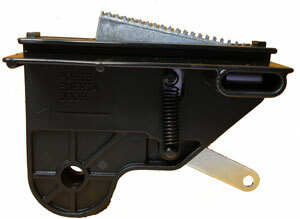 Genie door openers straight arm. Genie door openers curved arm. SD Series, G Series (excluding G-CL). Includes 3 rail and screw sections for standard 7' lift. Includes rail straps and hardware. **IMPORTANT** THERE IS NO RETURN ON THIS ITEM. G-CL Series, IS Series clutch less rail. For all Genie Screw Drive models with a date code after 01/04. The date code is found on a white sticker under the light lens cover on the power head. For all Genie DIRECTLIFT garage door openers 2060L, PLUS 3060L. Heavy Duty 60 watt bulbs. Vibration resistant. 2 per pack. These safety sensors are compatible with all Genie door openers, EXCEPT those that used a 3-pin plug connector at the motor head and internal wiring at the sensors (sensors had to be taken apart to connect wiring), and model 2040L. For model 2040L use 36046R sensors pictured below. If your garage door opener does not currently have sensors, this system will not work. Compatible with Overhead Door Code Dodger brand Garage Door Openers. Includes safety sensors with bracket attached and screws. No wire included. 90' spool, 2 conductor wire for damaged wire repair. For use with wall buttons or safety sensors. 30 insulated staples with 2 screws. Used for mounting wall button and safety sensors wiring.